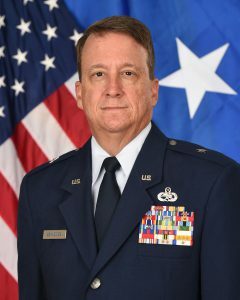 ­­­­Brigadier General Peter R. Schneider is presently assigned as the Assistant Adjutant General – Air, Louisiana National Guard, Jackson Barracks, New Orleans, Louisiana. As the Assistant Adjutant General – Air, he assists the Adjutant General in formulating, developing, and coordinating programs, policies and plans for the entire Louisiana Air National Guard. General Schneider began his military career by enlisting in the 159th Consolidated Aircraft Maintenance Squadron as an Aircraft Electrical Systems Specialist in July 1984. He received his commission from the Air National Guard’s Academy of Military Science in December 1991. He served in various staff positions throughout the Louisiana Army and Air National Guard, giving him extensive knowledge and capabilities at the joint level. General Schneider has commanded at the flight, squadron and group level. He is an Aircraft Maintenance and Munitions senior level officer, having represented the F-15 weapons system council maintenance chair and several advisory boards. General Schneider commanded task forces comprised of Airmen and Soldiers during statewide emergencies. November 2014 – May 2016 Chief of Staff, Louisiana Air National Guard, Jackson Barracks, Louisiana.